maison de pêcheur d'origine située dans la partie ancienne du village Es Grau. Ce chalet a conservé ses caractéristiques d'origine tout en offrant le confort d'aujourd'hui, y compris la climatisation. Le chalet dort quatre, et l'annexe dort deux autres. Il y a deux chambres à coucher dans le chalet dont l'un est double et l'autre un jumeau, qui rejoignent la salle de bain, salon confortable avec table à manger et cuisine. La petite annexe séparée avec deux lits simples offre un hébergement supplémentaire. (S'il vous plaît contacter le propriétaire pour plus d'informations) À l'arrière du chalet il ya une zone patio avec table à manger en plein air, barbecue et bougainvilliers. 5 minutes à pied de la plage, des restaurants locaux et le petit port d'Es Grau. Le chalet est très confortable et les commentaires que nous avons reçus ont été très positifs. S'il vous plaît ne nous contacter pour plus d'informations ..
Salle de bains attenante à la chambre 1 et 2, avec salle de bain / douche chaude et froide, lavabo et bidet, wc séparé. Salle de bain 2 situé en plein air avec douche chaude et froide, lavabo et wc. À l'extérieur: Attractive zone patioed privée avec table et chaises pour les repas en plein air. Bougainvillea en cascade sur elle et barbecue, salle de bains et douche extérieure. Appartement tres sympa, avec plein d'équipements, des livres et tres tranquille ! Lovely, simple, comfortable cottage, in a gorgeous, unspoilt village. Couldn’t be better. Es Grau is a rare little paradise, very safe and full of charm, such places are hard to find. We've had a lovely stay in Es Grau - our first trip to Menorca and we wanted to stay away from the big resort areas. The house was perfect for our needs, pretty cool in the day, kitchen area was well-equipped, beds were comfy. The outside area was great, we are all of our meals outside and the plant canopy provided perfect shade. We loved the big trunk in the garden with all the beach stuff we could possibly need. It was tricky parking near the house - it's a shame that the driveway can't be used, but we generally found space a couple of minutes away. We loved Es Grau itself - very laid back and everything so close by. Menorca en Kayak was fab and we can recommend the guided tour to the beaches and island. Also had a go at paddle boarding. Amazing stargazing just up the hill, we were treated to a great view of the meteor shower. Fantastic location, comfortable property - would recommend. We have been going to this cottage for 15 years now in Es Grau. This time we were amazed at all the lovely work and alterations that have gone on inside. We found the ceiling fan made a big difference with the whole fortnight being so exceptionally hot for Menorca. At night time we always opened the windows and closed the outside shutters to, which kept us cool enough. The new beds we found very comfortable and the cottage as always was very clean. In the kitchen we were happy to discover a brand new fridge freezer and we ate most of our meals out back, on the patio which has also had new furnishings. The Bougainville's have grown over to provide adequate shade for us. All for all we had such a relaxing, peaceful holiday in Es Grau, and we would recommend this cottage to anyone for value for money and to experience a traditional Menorcan village. 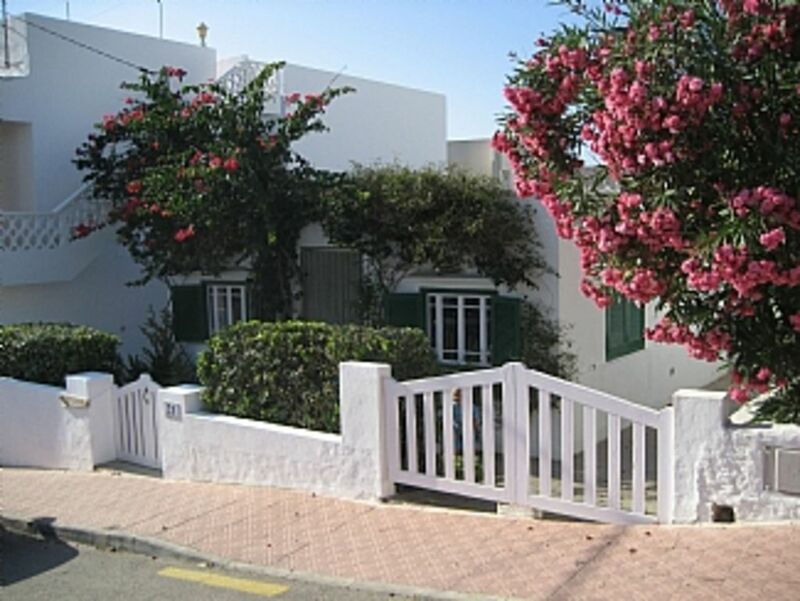 An attractive old cottage - not easy to find older properties to rent in Menorca. Only a few minutes' walk to the beach. The owner gave helpful advice before our arrival. Because the property is only one storey high, heat permeates through to all rooms. We were there in May / June and it was pretty hot inside then - we would imagine it gets pretty uncomfortable in the height of the season as there's only a ceiling fan in the living room to combat the heat. Of course, you can open windows but you are then susceptible to attack by biting insects as there is no mosquito netting across the windows. The other main disadvantage is that the outside areas are not especially inviting - no views other than of the walls surrounding the property and neighbouring houses. The area at the back of the house could be made more attractive, e.g. by adding more plants in pots, a couple of sun loungers, and replacing the sun umbrellas, which are now rather tatty. As it is at the moment, it's rather dreary. Thank you for your feedback in 2016 we have installed air conditioning in the cottage. The bouganville has since grown to the rear and this year summer 2016 it was blooming. There is plenty of shade with no need of parasols. We have left two reclining chairs. Plage de sable très sûre pour les enfants à moins de 5 minutes à pied des eaux cristallines. Comprend les sports nautiques, canoë, kayak, bateaux à voile et location de pédalos. Excursions et promenades disponibles dans la réserve naturelle. 10/15 minutes en voiture de l'aéroport de Mahon, à 10 minutes en voiture du port de Mahon. 10 minutes en voiture du centre-ville de Mahon, 40 minutes de Ciutadella, 25 de Fornells et 20 de toutes les destinations populaires de la côte sud, y compris les belles plages et les villages organisant les fêtes les plus importantes. Es Grau est situé dans une réserve naturelle bien connue et protégée (Biosphère Unesco) avec l'opportunité d'observer des Fora et Faune uniques. Il est situé entre un lac La Albufera d'Es Grau et une belle baie double avec des plages isolées et des eaux claires peu profondes. Il est un village de pêcheurs très calme et joyeuse avec de belles maisons pittoresques. Il ya une atmosphère très conviviale et il est particulièrement sûr pour les enfants. Il ya un petit supermarché et trois bars qui servent tous de la nourriture fraîche et beaucoup de tapas, Bar Es Grau, Bar Es Moll et Bar Ca N'Bernatdette ce dernier a une très bonne réputation pour servir du poisson frais. Il y a aussi un restaurant haut de gamme appelé Tamarindos sur le front de mer qui est un must pour au moins une nuit. Il n'y a pas les banques à Es Grau. Pour la banque la plus proche, vous devez aller à Mahon.